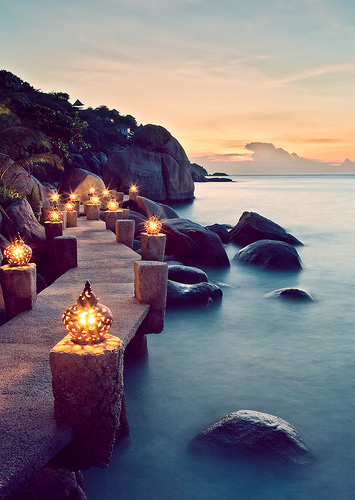 Ko Tao is an island in Thailand located near the western shore of the Gulf of Thailand. It covers an area of about 21 km². Administratively it forms a tambon within the district (Amphoe) Ko Pha Ngan of Surat Thani Province. As of 2006 its official population is 1,382. The main settlement is Ban Mae Hat. The economy of the island is almost exclusively centred around tourism, especially scuba diving. Ko Tao was named by its first settlers after the island's turtle-like geographic shape. Coincidentally, the island is an important breeding ground for Hawksbill turtles and Green turtles. Development of tourism has negatively impacted the health of these grounds but a breeding programme organised in 2004 by the Royal Thai Navy and KT-DOC, a coalition of local scuba diving centres has reintroduced hundreds of juvenile turtles to the island's ecosystem.